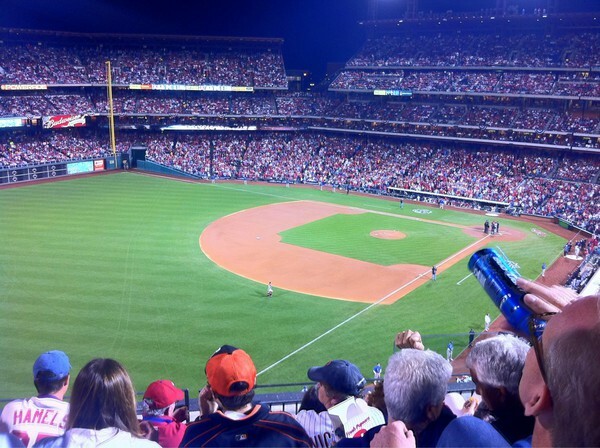 In honor of the 3 game series opening this evening in Camden Yards between the New York Yankees and the Baltimore Orioles, I figured this was an appropriate time to pass along the story of how I was heckled and told to sit down for rooting for the O’s in BALTIMORE!!!! For years now, well really since the Orioles last winning season in 1998, and especially after Cal Ripken retired in 2001, the club has struggled to draw fans to Camden Yards. The appeal of the still gorgeous looking, trailblazing retro ballpark has not been able to overcome rosters full of overpaid (Albert Belle), over the hill (Miguel Tejada the 2nd time) players and an owner in Peter Angelos who Orioles fans loathe with a passion akin to maybe only the budding relationship between Jerry Seinfeld and Donald Trump. 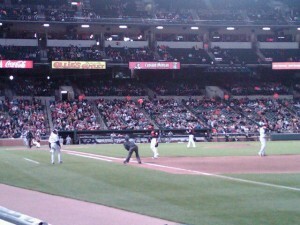 Baltimore’s Inner Harbor, with its various attractions, restaurants, and aquarium, still attract tourists to the downtown area but these crowds do not always migrate the 6 blocks or so west to the Warehouse to catch a baseball game. That is unless the Orioles are hosting either the Boston Red Sox or the New York Yankees. Like a swarm of locusts they descend upon the Charm City devouring anything that crosses their path. 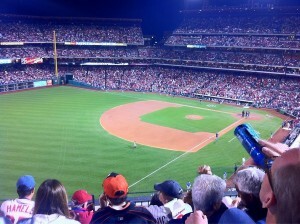 Merchants and hotels love it when these two teams are in town because it means a tremendous boost in sales. Orioles season ticket holders enjoy the return on their investment as Yankee and Red Sox fans are more than willing to shell out the extra dough for a game at Camden Yards because it still cheaper, travel down the northeast corridor included, than taking a family of four to a game at either Yankee Stadium or Fenway Park. All of this being said, having so many Sawx and Yanks fans in OPACY does not make for an enjoyable experience if you happen to support the home team. Now to my tale. It had to have been around 5 years ago that my girlfriend, now wife, and I made what has become our annual trip down to Baltimore to catch a couple of Oriole games. For us, we go all in. Fancy Hampton Inn 25 minutes outside of the city? Done. Nothing but the finest dinners at places like Pizzerio Uno and Hooters? You got it! We live for the entire experience. That was until the moment where I was belittled in my own ballpark. I think it was right after I stood up to celebrate a Jeff Conine home run against the Yankees that a New York fan in the Eutaw Street bleachers told me to “sit down and shut up”. If this were Yankee Stadium, I understand a fan defending their turf but this was Oriole Park and as an Oriole fan I thought I had a right to root for the home team. My reaction to this verbal chiding? Nothing. Zero. Bupkis. 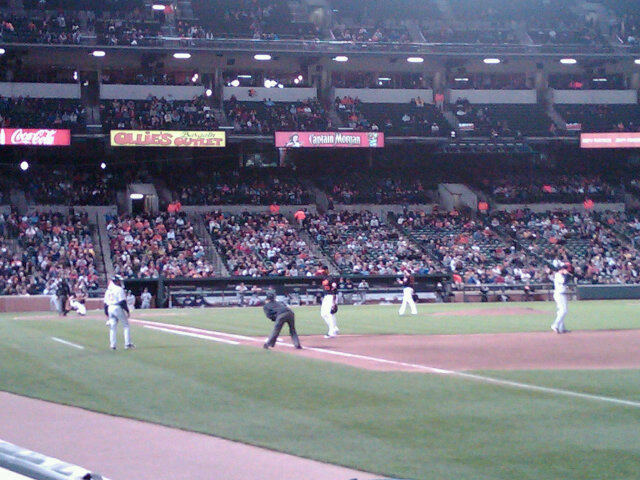 And here’s why, when the Yankees and Red Sox are in town, their fans outnumber Oriole fans 5 to 1. I must have been surrounded by an entire section of Staten Island’s finest. In this moment of spiritual survival I couldn’t locate a single ally. A verbal and/or physical altercation would not have worked out for me. Speaking up also would have put my girlfriend in jeopardy of verbal abuse and I wasn’t about to bring that sort of ridicule and embarrassment onto her. 5 years, and as many losing seasons later, I have had to live with the shame of being booed in Camden Yards for cheering on the Orioles. I must also live with my wife constantly reminding me and anyone else who will listen that when confronted by a Yankee fan in Oriole Park, I stood down and did nothing. Of course pride is often the highest form of self indulgence so I can keep my head high while continuing to avoid Camden Yards anytime the Red Sox and Yankees are in town. At some point this winter, someone is going to construct a formula that will show just how much money Cliff Lee made himself pitching Game 3 of the ALCS. The “soon to be free agent” was simply dominant against an overmatched,aging New York Yankee lineup. It was such a struggle for the Yankees, and their fans, that the entire stadium stood and applauded a full count to Mark Teixeira in the bottom of the 4th inning. More impressive than his final line (8IP, 2H, 1BB, 13K, 0ER) was the way Lee went about carving up the best lineup in baseball. He was not so much overpowering as he was accurate. How many Yankees couldn’t resist swinging at that 2 seamer tailing away from the strike zone? So where do we go from here? Early word this morning is that AJ Burnett is still scheduled to take the mound in Game 4. We shall see if this actually happens because I’m sure Joe Girardi is feeling the pressure to go with Sabathia in game 4 and 7, if necessary. By the way, I think the Yankees still have a great shot to win this series. Fans turned out in record numbers to watch Cy Young award winners CC Sabathia, Tim Lincecum, and Roy Halladay take to the mound in the opening weekend of the MLB League Championship series. It comes as a major surprise that, with all this pitching talent, Cody Ross would be the player every fan is talking about this morning. Ross, who came over from the Marlins in a late season trade, belted 3 homeruns this weekend, 2 off of Halladay Saturday night, to lead the Giants to a crucial 1-1 series split in Philadelphia. As the games shift west to San Francisco, expect to see more great pitching as the likes of Matt Cain and Cole Hamels prepare to take their turn. Sabathia and the Yankees are relatively lucky to leave Arlington with a 1-1 split. Except for the 8th inning of game 1, the Rangers have outhit, outpitched, and outplayed New York. 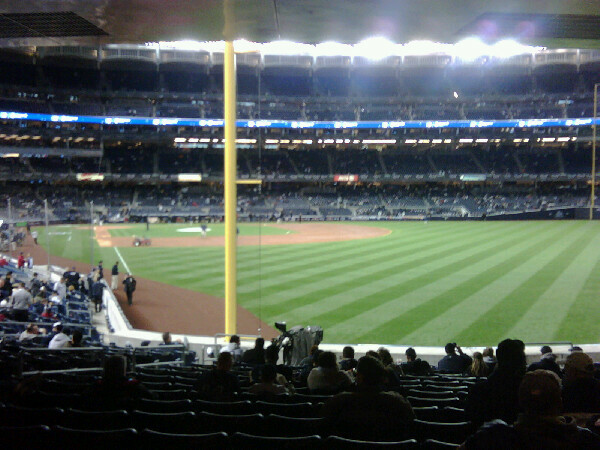 Tonight represents an enormous game for the Yankees, who will face Cliff Lee and his impressive playoff ERA. Yankee fans are hoping that Andy Pettitte can come through tonight because that means that unless Joe Girardi sends Sabathia back to the mound on short days rest, AJ Burnett will start game 4 for NY down 2-1 in the series and that makes all Yankee fans very, very nervous.